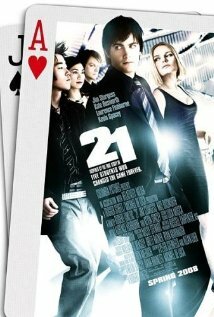 Ben (Jim Sturgess, Jude in Across the Universe) is an MIT math whiz who joins a group of students working for a professor, Mickey Rosa (Kevin “House of Cards” Spacey) counting cards in Las Vegas. After a predictable love affair with fellow team member Jill (Kate Boswell), he falls victim to the glamor of Las Vegas, ultimately leading to conflict with Rosa and casino security consultant Cole Williams (Laurence “Morpheus” Fishburne). Well acted and solidly written, this interesting variation on a rags to riches caper story somehow never quite makes it from good to great, but it’s definitely watchable. This entry was posted in movies and tagged 21, card counting, cole williams, jim sturgess, kate boswell, kevin spacey, las vegas, laurence fishburne, mickey rosa, movie, review. Bookmark the permalink.